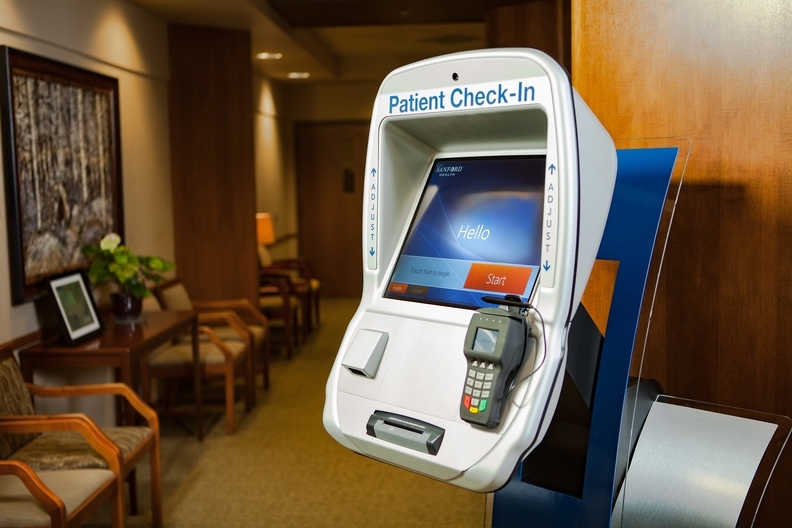 Sanford Health has set up kiosks at some of its clinics to help patients understand what their care will cost prior to treatment. The South Dakota-based provider's pilot program shows patients their estimated out-of-pocket costs, co-pays or other balances or collections at a station that looks strikingly similar to an airline check-in kiosk, said Michelle Bruhn, Sanford's senior vice president of finance for health services. The automated registration kiosks, which Sanford plans to install in more clinics, have increased the system's upfront collections dramatically, Bruhn said. Securing payment has been one of the issues confounding providers that have seen their bottom lines take a hit as more patients delay or fail to make payments for the medical care they've received, a new study found. Nearly 3 in 5 Americans (56%) delay paying their medical bills, in large part due to high insurance deductibles and confusion regarding insurance coverage, according to an analysis by communication and network infrastructure company West Corp. of revenue-cycle challenges. This adds to the financial stress of hospitals and health systems that are facing dwindling reimbursement levels and rising infrastructure costs related to new payment models. While Sanford hasn't seen its bad debt or uncompensated-care levels rise yet, it is preparing for the eventuality, Bruhn said. "We do expect there will be increased cost-sharing in health spending," she said. Two-thirds of the respondents said their financial situation makes it difficult to pay their medical bills on time, and more than one-third (37%) would not be able to afford an unexpected medical bill for more than $100 without going into debt. About 42% of respondents delay payments because of unexpectedly high deductibles while 30% report that they put off payment because they are unsure how much insurance will cover or they dispute the charges. About a quarter said they wait to receive the final bill so they are sure of the amount owed. Sanford has a financial counseling team that works with patients to set up payment plans and presents opportunities for financial assistance, Bruhn said. "We walk a fine line because you cannot hold back care based on an inability to pay, but we can help reduce stress by spending time with inpatient populations," she said. Three-quarters of patients say high deductibles affect how often they visit the doctor, which often increases the cost of care when they skip preventive visits and their health deteriorates. To make preventive care more attractive to patients, providers need to educate them about the actual costs of routine services and screenings, researchers recommended. The average annual deductible for family policies purchased through the exchanges was $8,232 in 2017, a 3% increase from 2016. Delayed or unsecured payments fuel the cycle of rising healthcare costs as providers shift the growing burden of bad debt and uncompensated care to patients via higher premiums. "Rising deductibles and growing healthcare costs are contributing to delayed payments and uncollected self-pay revenues that threaten the financial viability of medical practices and hospitals," the study said. Only about a quarter of providers discuss each patient's ability to pay before treatment, 21% send automated reminders on payment due dates and only 15% send messages to explain bills and let patients know what portion of the cost is covered by insurance, according to the survey, which was sent to more than 1,000 Americans and 236 providers. This likely contributes to the 36% of respondents who forget to pay their bill. Providers can engage patients in conversations about healthcare costs to mitigate potential barriers and communicate costs prior to billing, researchers said. Hospitals can send payment reminders and notify patients when a bill is overdue, they said. The average hospital, which has 120 beds and 15,000 monthly patient visits, is losing $8 million to $10 million annually in unsecured patient revenue, according to Tom Brekka, CEO of VestaCare, a platform that breaks down healthcare bills to patients and helps secure patient payments upfront through monthly installments. While only a sliver of hospital revenue was derived from patients 10 to 15 years ago, today, patients account for nearly a third of their revenue, Brekka said. "This trend toward patients being the primary source of revenue is continuing, and the rise of high-deductible plans are only going to make it dramatically worse. It's a big nut to crack," he said. "We see hospitals running operating losses and bad debt is $10 million-plus as well. It's the kind of thing that if it isn't fixed, hospitals will close." Healthcare providers can maximize reimbursements and improve outcomes by enrolling as many patients as possible in chronic-disease management programs, the study recommended. They should leverage their EHR system to identify eligible patients and send them an enrollment email through an automated appointment reminder system. Providers can bill Medicare if they provide at least 20 minutes of support per patient each month, possibly through monthly calls to schedule visits, relay surveys gauging their health and navigate billing, researchers said. Ochsner Health System increased revenue by $685,000 by using automated appointment reminders to book preventive screenings for colorectal cancer patients, according to the study. Leveraging existing technology is the best way to engage a generation that has grown up with technology at their fingertips, Sanford's Bruhn said. "We are among a whole generation that are so tech-savvy, it's how they do all their business," she said. "We need to meet them where they are most comfortable."